I am so happy to be doing a review for Pure Play. Mike Grant, the founder of Pure Play Kids was one of the 1st ‘likes’ to my page, finding my page within a week of launching it in Feb of ’12. We had a great chat about made in the USA & why it was important, and I found out about his amazing company straight from the owner himself (thanks to FB timeline you can scroll back to Feb 28th & find the conversation under the “responsibly made in China” thread, if you wish). Since then, Pure Play has been one of the 1st places I search if someone asks about a toy made in the USA, because chances are they have it. 90% of the items they sell are made in the USA, with the rest made in Europe. You will not find a single item made in China through them, and it’s something they take very seriously. Here’s info from their website. From their website: “At Pure Play Kids, we do things the right way, not the easy way. 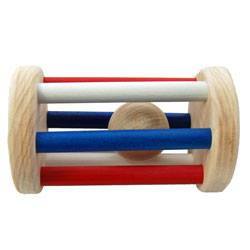 Despite the challenges, we decided to make our wooden toys in the United States. China would be cheaper and easier, but we want to create American jobs and to have complete quality control of the materials and work from start to finish to make the best wooden toys available anywhere. We know our customers also make choices, and we appreciate each and every one of our supporters whether you buy from us, write about us or tell others about us. Know that you are helping us bring back toys with better values and stronger development qualities. Also know that your support of us and businesses like ours is the key to creating great jobs here in the United States. In addition to the toys we design and make ourselves, Pure Play Kids also sells toys made exclusively by other small US and European toy makers who share our goals, values and commitment to quality and safety. Play Power: Play is the work of children, and toys are the tools. Play is sacred, and toys should be cherished. Through unstructured play we nurture our imaginations and develop emotionally, socially and cognitively. Pure Play Kids stands for toys that are kid-powered (not battery-powered or based on TV/movie characters), open-ended (not pre-programmed), and will grow with kids (allowing parents to buy better, not buy more). Of course, our toys are also all about FUN! Integrity: We have a responsibility to our children, our people and our planet. We sell wooden toys, recycled and other natural products wherever possible; such products are kinder to our world and safer for our children. Pure Play Kids does not market to kids through advertising, licensed characters, film tie-ins, or noise- and light-starting buttons marked “Try Me!” All Pure Play Kids toys are made in the USA or Europe to ensure product quality, product safety, the dignity and freedom of workers, and stricter environmental standards. It’s about giving our kids their best possible world, after all. Quality Products: Pure Play Kids adheres to the strictest American and European standards. Our products are constructed of safe, durable and non-toxic materials. Our toys last longer – both physically and in terms of maintained interest – than plastic toys, so they won’t end up in a landfill in months. Our toys also pass the Living Room Impact test: they will look far better occupying all rooms of your house than will plastic toys. Their website is HUGE, with tons of categories to browse through. I went straight to their ‘best sellers’ tab to get an idea of what others are enjoying from them, and the selection is just astounding! It’s one of those places where I honestly would love to have one of everything they offer, and be able to rest assured that it is safe. You can shop by age which is always a feature I appreciate to help narrow down the choices. Some of the categories of products include: handmade organic dolls, capes & dress-up gear, art supplies, hand & finger puppets, doll houses & gear, kitchen/market play, wooden animals, puzzles & blocks, outdoor fun, tub time, Waldorf, classic wooden wagons, and a sale category that many of us appreciate And they offer more than just toys- you’ll even find bamboo burp rags, crib sheets, towels & washcloths all made in the US, & SO, SO much more. 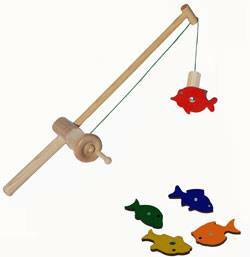 They sent me the amazingly adorable magnetic wooden fishing pole in the picture, and an adorable wooden rattle for Althea (will attach as a separate photo). We are a very outdoorsy family & my husband does quite a bit of fishing. My son had been going with his Dada often and wanting to fish for himself so we recently purchased a toddler fishing pole for him before realizing it is just too early for him, he was going to destroy it before he got the hang of casting. Thus, this is the perfect toy for him at just the right time. I had no idea what they were sending me & it was so fun to get the package & tell my toddler it was for him & see the look on his face when he saw the pole. It has a working reel with 3 feet of string, and you can even purchase a set that includes a larger one for Mama/Dada to fish with babe. It comes with 5 magnetic fish. Mike included a handwritten note stating that the fishing pole is made from sustainable American hardwoods and a finishes that have won prizes for their safety & environmental-friendliness. It’s labeled for ages 3+, but is perfect for my son at 2 ½. It sells for $29.95. The only other thing I own from them is a ½ dozen wooden eggs that I purchased for my son’s wooden kitchen (that a local family is borrowing us!). I certainly can’t wait to add many more of their offerings to our collection over the years! With 201 items under $25 and $6.95 flat rate shipping, I feel that Pure Play Kids truly offers something for every budget. Finding something your kids will enjoy will certainly not be a problem. I’m so thrilled that people like Mike & Tonia Grant are following their passion to create & provide safe, fun, engaging toys for their family, and ours and can’t wait to see what they’ll come up with next!